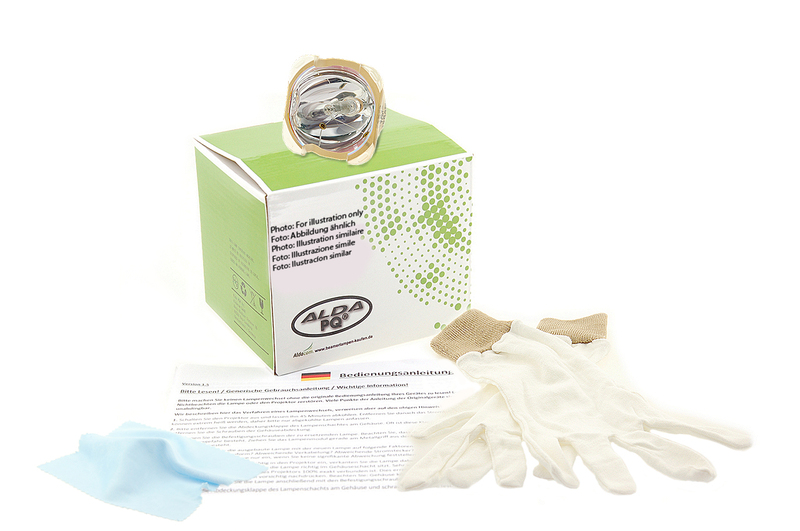 Alda PQ Original, Rebuild Kit for projector lamps contain a high-quality Philips bulb and are being delivered without the housing. It‘s the clever alternative as you merely replace the bulb in your original lamp module and thus save money without giving up on performance and quality. Contents: Philips bulb, installation gloves, manual. These lamps achieve very good brightness and contrast levels as well as an excellent durability and product quality through the application of the high quality Philips bulbs. Alda PQ Original, Rebuild Kit for projectorlamp modules. It‘s the clever alternative as you merely replace the bulb in your original lamp module and thus save money without giving up on performance and quality. These lamps achieve very good brightness and contrast levels as well as an excellent durability and product quality through the application of the high quality Philips bulbs. Please install the lamp in strict adherence to the provisions stated in the operating manual of your device. Make sure to meticulously check the chapter regarding the replacement of the lamp and follow the safety instructions. Verify that the lamp within the lamp housing has the appropriate fit and screw the power cable of the plug to the bulb with the same polarity as with your previous lamp.